… is that I am now officially PADI certified! And I’m absolutely thrilled. Although I have to admit, I am aware of the irony that I spent more than twenty years living in the Caribbean and never learned how to dive until moving here. What a waste! All those decades of snorkelling when I could have been diving. Who would have thought I would have to come all the way to Hong Kong to learn scuba? That’s like growing up in the Alps and then learning how to ski in an indoor snow mountain in Dubai! 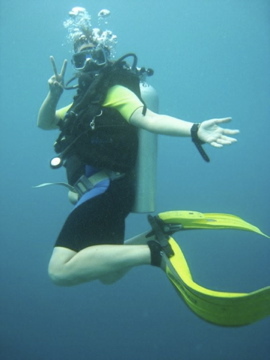 Anyway, it feels good to be a diver, and I’m now thinking about where will be my first dive trip. Diving in southeast Asia is both cheap and plentiful, especially in places like the Philippines and Thailand. Diving in Hong Kong is not so great, you don’t see much sea life and there aren’t many reefs. But maybe learning in Hong Kong is a good thing — although the visibility isn’t so high, it’s good for training, and at least now when I go on holiday I won’t have to waste three days learning theory and being in the pool in some hotel… I’ll just be ready to go. Getting certified comprised a classroom session on day one, followed by an intense written test (the other guy in the room had already failed once!). But I passed. Phew! We then went to the pool to do our controlled water dive. The new guy who joined us, David from California, was visibly nervous. He had passed the written test, but failed his previous pool dive because he panicked and tried to rip off his gear. It was indeed a bit scary at first, jumping in with all the gear for the first time, trying to regulate your heart rate, your breathing, and handle all your equipment. Took about 15 minutes to truly, completely calm down and start to feel normal. Andy the teacher was great, very patient, and gave good instructions. We did all the theory and the practice, such as maintaining your buoyancy, staying afloat while taking off all your gear and then putting it back on again, or taking off your mask, swimming for a bit, and then putting it back on. And when we were done, I was pleased to hear Andy say that I was a natural in the water, but considering the millions and millions of hours spent at the beach, I have an unfair advantage. Yesterday was the final part, doing an overboard dive from the dive shop’s boat. There were about 30 people there, many of them doing more advanced classes, and my group of beginners was just four. The boat took off from the pier and headed out into Sai Kung, the lush eastern area of Hong Kong. Extremely beautiful. And there was just an air of excitement on the boat when we arrived, people strapping on their tanks, people doing buddy-checks on each other’s equipment, getting on the wet suits. It was good fun. But there is quite a bit of theory to remember. Yesterday, when I got back home and washed off the salt water, I was exhausted, but happy. I can’t wait to do a dive somewhere that is teeming with wildlife and reefs, to really enjoy diving.